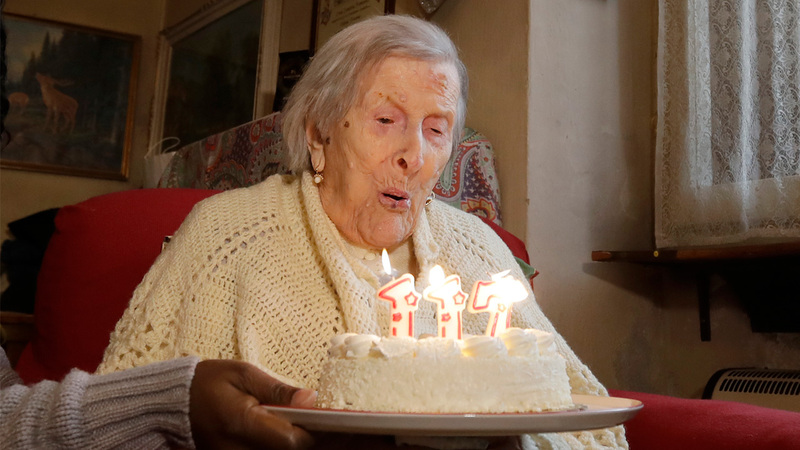 ROME -- Emma Morano, at 117 the world's oldest person who is also believed to have been the last surviving person born in the 1800s, died Saturday at her home in northern Italy, her physician said. Dr. Carlo Bava told The Associated Press by phone that Morano's caretaker had called him to say she had stopped breathing in the afternoon while sitting in an armchair at her home in Verbania, a town on Italy's Lake Maggiore. Bava said he had last seen his patient on Friday when "she thanked me and held my hand," as she did every time he called on her. While Morano had been increasingly spending more time sleeping and less time speaking in recent weeks, she had eaten her daily raw egg and biscuits that day, he said. Bava also lives in Verbania and had been her physician for nearly a quarter of a century. Morano, born on Nov. 29, 1899, had been living in a tidy, one-room apartment, where she was kept company by her caregiver and two elderly nieces. "She didn't suffer. I'm happy she didn't suffer but passed away that way, tranquilly," Bava said. "She was slowly fading away," Bava said. Bava has previously told the AP that Morano lost a son to crib death when he was six months old and left her husband in the first-half of the last century after he beat her. Morano "abandoned the husband in the Fascist era, when women were supposed to be very submissive," Bava said in a 2015 interview. "She was always very decisive." Morano went on to support herself by working in a factory making jute bags, then at a hotel, working way beyond the usual retirement age. She also defied health advice, Bava said Saturday. Some doctors had warned her against eating three eggs daily, which she did for years, but she ignored their advice.